HomeGeneralHow do You Celebrate National Pretzel Day? With Free Pretzels! How do You Celebrate National Pretzel Day? With Free Pretzels! Today is National Pretzel Day, a fun fact I learned this morning from the Internet (thanks AL Gore). But before I go any further, stop and look at this picture of pretzels by Ana Ulin in Germany. I will note that these are pretzels at Google Munich. I’m no fan of Google, but they provide some good looking pretzels for their employees. Upon learning of today’s importance, my first thought was to wonder who decided to so honor the humble pretzel. My extensive research into this topic (a quick search on Bing) reveals that we have then-Rep. Robert S. Walker of Pennsylvania to thank for commemorating the day. Rep. Joseph Pitts of Pennsylvania also mentioned the day in Congress in 2001. In 2003, then-Gov. Ed Rendell of Pennsylvania (are you detecting a pattern here?) declared April 26th National Pretzel Day as an annual event. I’m not sure how the Governor of Pennsylvania obtained the power to make the celebration of the pretzel a national event, but we’re still celebrating the day, so it must be legit. In this age of political rancor, it is refreshing to see an issue on which both Republicans (Walker and Pitts) and Democrats (Rendell) can agree. It’d be better if they could agree on something a bit more important like immigration reform, but you take what you can get. According to a press release on PR Newswire by Snyder’s of Hanover, 80% of the pretzels consumed by Americans are made in Pennsylvania, the home of hard pretzels. The average American consumes up to two pounds of pretzels per year. 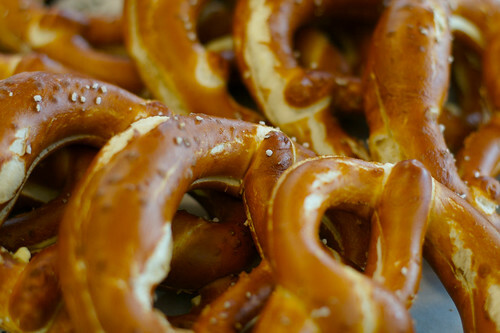 Philadelphians go above and beyond, however, and eat about 12 pounds of pretzels per year. Is that true? I don’t know, but if you can’t trust a press release, what can you trust? Click the picture (provided by PR Newswire) to read more. Now it’s time to get to the point of this post. Sure, it’s great knowing how today is National Pretzel Day, but to really celebrate the occasion and appreciate why politicians in Pennsylvania are so obsessed with pretzels you really need to do one thing… eat a pretzel. And if eating one pretzel is good, it must be better to eat more, right? If you think that way, then you’re in luck, because a number of pretzel retailers are going to take care of you today with… wait for it… free pretzels! Yes, free pretzels. Some vendors are asking or a donation to a local charity in exchange for that free pretzel, but that’s a small price to pay (literally). Here’s a list of places you can go to get a free pretzel today. Follow the links and see if they’re in your area. Auntie Anne’s – No national promotions, but local stores may have promotions. Stop by and see what they’re offering. Philly Soft Pretzel Factory – One free soft pretzel. Be one of the first 100 guests at their locations and receive a card good for one free pretzel each day in May. Wetzel’s Pretzels – No national promotions. Check with your local locations to see if they have any offers. Check your local pretzel makers — There really weren’t many national retailers I could find with promotions, so make sure you support your local businesses and see what the pretzel makers in your area are offering today. For example, folks in St. Louis know the best pretzels are at Gus’ Pretzels. It doesn’t appear that they have any special offers, but check out the story on KSDK. I don’t know about you, but I’m hungry. Maybe I’ll see you out there today on the hunt for free pretzels!